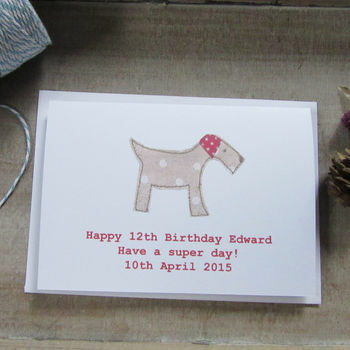 A beautiful, printed from an original embroidery, card made to celebrate a little boy's or even a grownup's birthday. The embroidery is inspired by Caroline's own little Terrier who sits watching her work and her love of four legged creatures. The original embroidery used pretty spotty fabric for the body of the dog and finished off with a red starry ear. The card could be framed and make a wonderful keepsake of the special occasion. The card design is taken from an original embroidery and is printed directly onto the card using a professional art printer. The print captures the fabric colouring and stitched textures of the original piece but is not actually an embroidered card. The text is printed in red. Made from FSC approved heavyweight white card. The card is blank inside for you to write a message. The card comes wrapped in a cello wrapper and has a matching envelope. This product is dispatched to you by Caroline Watts Embroidery.